See also category: Flags of Argentina. Deutsch: Die Wappen von Argentinien. English: The coats of arms of Argentina. Español: Los escudos de armas de la Argentina. Français : Les armoiries de l’Argentine. Nederlands: De wapens van Argentinië. Português: Os brasões de armas da Argentina. 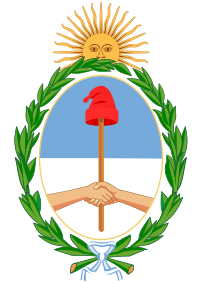 Media in category "Coats of arms of Argentina"
This page was last edited on 31 May 2018, at 23:51.